Are you a single parent? Do you know a single parent? Have you ever needed help before? Year after year, many single parent households are not able to provide for their children during the Holiday Season. A number of these single parent family's income is not low enough for government assisted programs, but their income also isn't high enough to provide the type of Holiday they would love for their children to experience. A Single Hand Foundation is hosting a Holiday Hearts Toy Drive to help 100 Single Parent (male or female) families. Bethel Dallas, Full on Faith and RESTORE has partnered with A Single Hand Foundation to turn this vision into a reality. We would like to help bring a smile to a child's face for the Holidays. By helping the child, we are also helping the parent with some of their holiday financial burdens. The toy drive is from October 1, 2016 - November 27, 2016 to collect new unwrapped toys for ages newborn - 10 years to give to children in single parent homes. Drop off new unwrapped toys at one of the Collection Sites on the Holiday Hearts Toy Drive flyer below. Monetary Donations: Please click, "Donate Now", listed below. All donations are used to purchase toys. A Single Hand Foundation is hosting various fundraisers to help make this toy drive a huge success for children in the community. Panera Bread Fundraising Night (Cedar Hill, TX) - Please join us on 10/20/16 from 4:00 pm -8:00 pm. Present a printed flyer or a copy from your phone. A percentage of the net sales from the redeemable flyer will go to the Toy Drive. 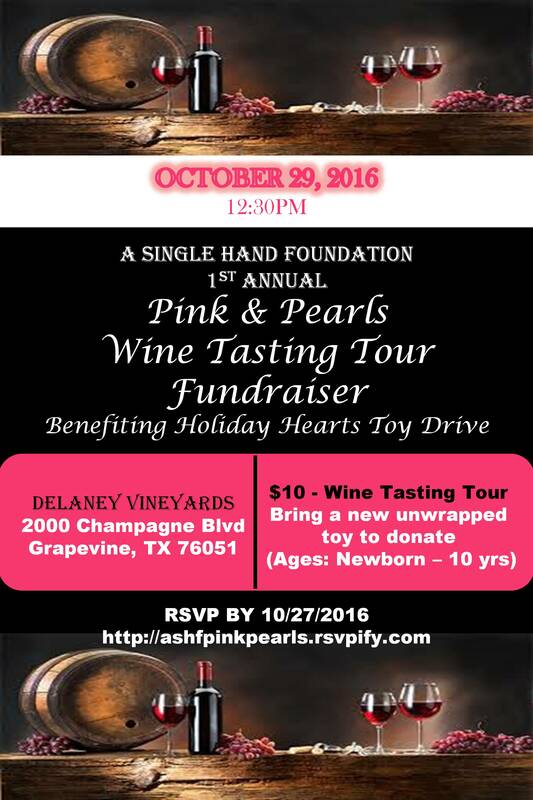 Delaney Vineyards Wine Tasting Fundraiser (Grapevine, TX) - Please join us on 10/29/16 at 12:30 pm for a Wine Tasting and Tour. Bring a new unwrapped toy to donate to the Toy Drive. Cowboys vs Baltimore Game Watch (Venue TBD) - Please join us on 11/20/16 1:00 pm to watch the Cowboys vs Baltimore game. Bring a new unwrapped toy to donate to the Toy Drive. 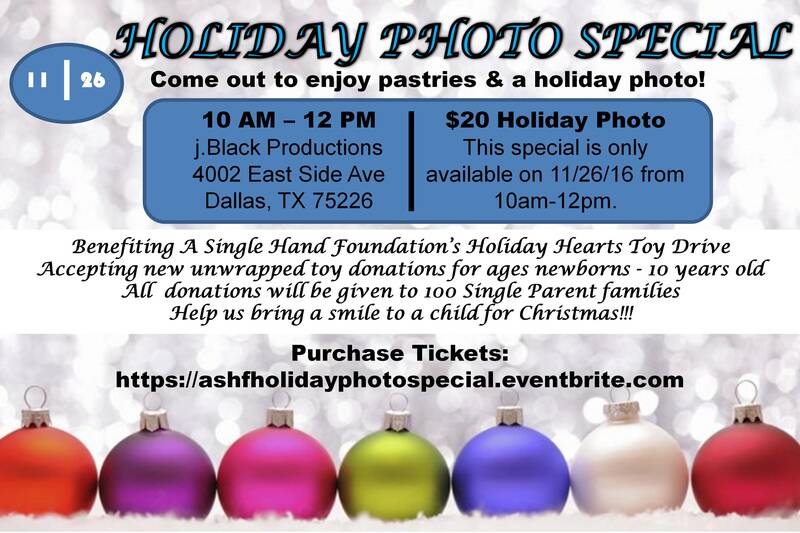 Holiday Photo Special (Dallas, TX) - 11/26/16 from 10 am - 12 pm: Accepting new unwrapped toy doations at this event. $20 Holiday Photo Special (1-4 people per mini photo shoot, up to 10 digital images, full copyrights, no edits). On 12/17/16, A Single Hand Foundation will host a Holiday Hearts Christmas Community Bash to hand out toys to children in single parent households that are in the communities of DFW and surrounding cities. Registration will be open the the public. We hope to make a huge impact and help 100 Single Parent families for the Holidays. All proceeds are used to purchase toys. Your donation is tax deductible.